Decorate your game room or man cave with canvas art prints! 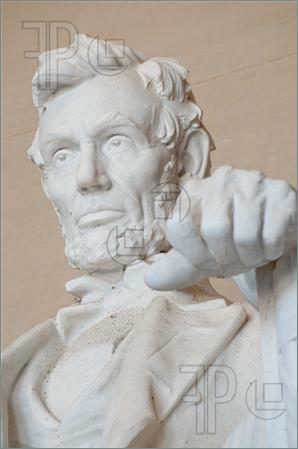 Brendan Bailey of www.easycanvasprints.com is offering a new service for military historians, wargamers, history buffs, photography buffs, and home decorators — photographs professionally printed onto high quality canvas and mounted on a wooden frame for display. These would be a cool addition to your game room, as you can customize the artwork with your own photography of your tabletop wargames, favorite battlefield scene, your Civil War or other living history reenactor unit, etc. 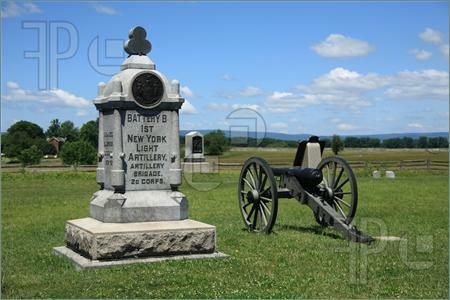 He also offers a large selection of his own stock photography of landscapes, cityscapes, battlefields, monuments, animals, and other topics, including several Civil War shots such as the one shown above from the Gettysburg National Military Park in south-central Pennsylvania. It’s actually quite simple. I visited Brendan’s website (link above) and downloaded a nice photograph of my wife and me and two family members standing in front of Hazlett’s Battery on Little Round Top. In just a few keystrokes I had uploaded my digital photo, selected the size I wanted and the type of edge finish, and then I was ready to check-out. It took only a few minutes from start to finish. Within 2 weeks, I received a well-packaged canvas print in the mail, which arrived in excellent condition. It was of high quality, with a very nice appearance. He had retouched and optimized the color imagery before transferring the digital photo to the canvas. Debi and I proudly added it to our display of family pictures. If you are looking for something unique and personal for your game room or another picture for your den or office, check out Brendan’s website. Be sure to mention the Charge! blog. 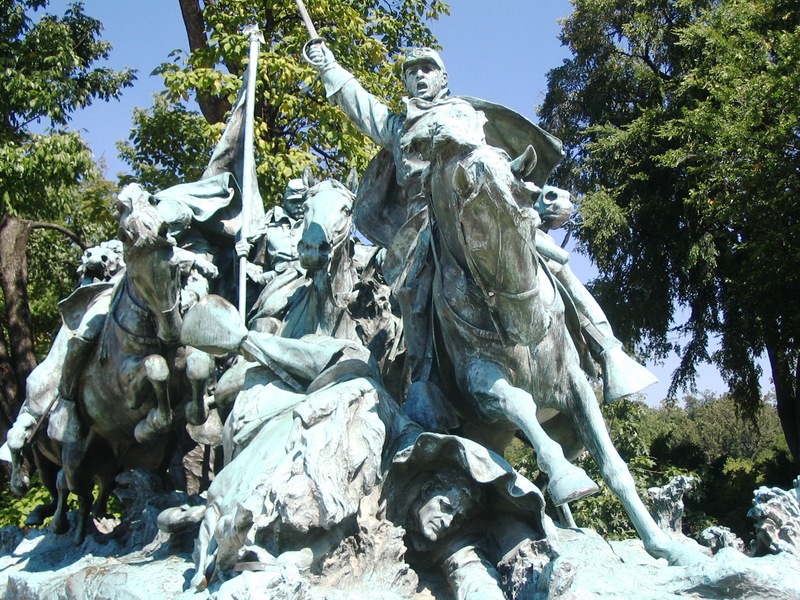 U.S. Grant memorial in Washington, D.C.
All photographs by Thomas M. Mingus of York, Pennsylvania. Used by permission. I was a guest author at the 10th annual History Meets the Arts festival in Gettysburg last month and was pleased to see so many exciting French and Indian War artists – some outstanding paintings and artists! I have gained a new appreciation for fine artwork. I enjoy browsing through the Civil War art galleries in Gettysburg, and especially like to walk through Dale Gallon‘s gallery. He’s one of my favorites, along with Bradley Schmehl, whose painting of the burning of the Columbia-Wrightsville Bridge is next on my target list. Last night, I was in a friend’s house over in Adams County and was admiring his impressive collection of John Michael Strain‘s works (I like his new bridge painting – I’m partial to bridges!). So, who is your favorite Civil War artist – Troiani, Maritano, Reeve, Kunstler, Gallon, Schmehl, Strain, someone else? And what is your favorite painting or subject matter? Why?